Products on the counters of Velozavodsky market in Moscow, which has recently reopened after renovation. As in any big city, living healthy in Moscow can feel like a second job. But with the help of these extraordinary farmers’ markets, your life will be much easier. 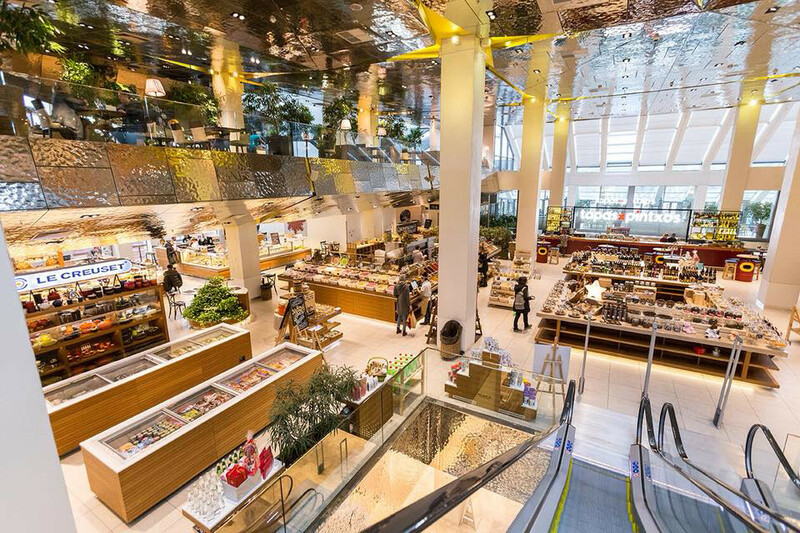 Perhaps Moscow’s most famous fresh food market, this impressive Soviet circus-like structure recently underwent renovations, and now resembles a foodie paradise reminiscent of London’s infamous Spitalfields Market. All the world’s most exotic and obscure groceries are on sale here – from lobster, to dragonfruit, to avocados the size of melons; all sold by passionate and persistent (but also negotiable) experts from around the world. The market is also littered with top-drawer street food stalls that provide some of the most diverse and value-for-money eating in the capital. Grab a top-drawer crab sandwich at celebrity chef Andrey Ryvkin’s United Kitchen for just 450 rubles ($7.30); go Caucasian with a dumpling plate at the Dagestanskaya Lavka for just 250 rubles ($4); or get a slap-up pho bowl at Bô for 350 roubles ($5.70). The best flat whites in Moscow can also be found at Chellovek I Parakhod. We haven’t even gone into your options for sushi, bread, cakes, Moroccan cuisine, Chinese duck, hummus, and curry – it’s literally all there. Just go. If that isn’t enough to convince you, then maybe the open-air seating will, which on a sunny evening is an ideal date spot. 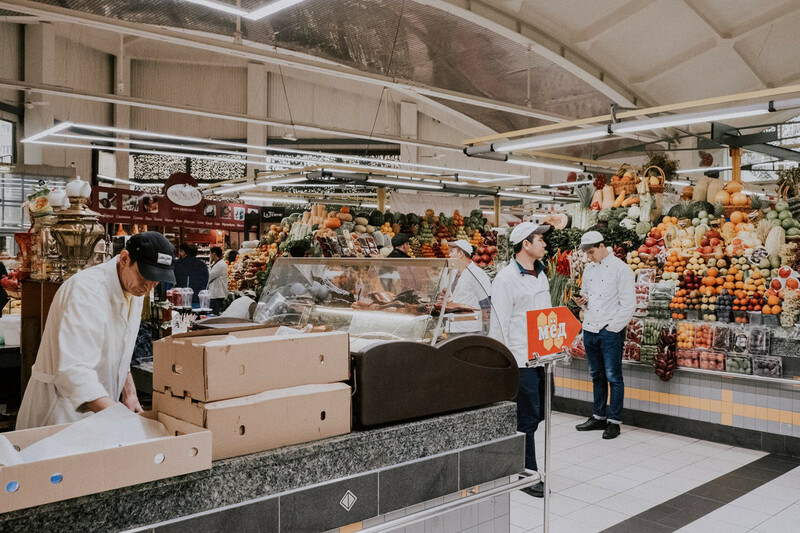 When: Daily, 8 a.m. to 9 p.m.
One of the best-designed buildings in the city, this central Moscow market is as grandiose as it is conveniently located. Dotted with magnificent columns that support a glittering metal ceiling, this market invites in those with a hole to burn in their pocket and sends them away satisfied. 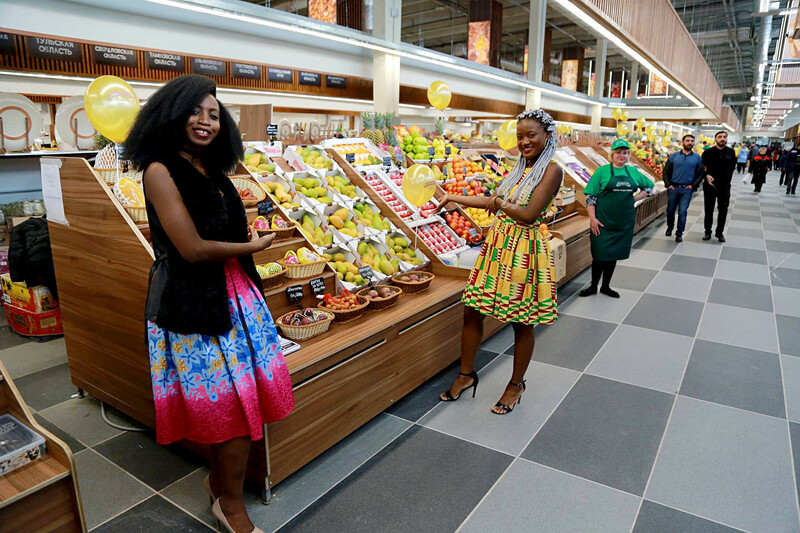 If you’re looking to push the boat out on groceries for a special occasion, come here rather than a luxury supermarket such as Azbuka Vkusa or Vkusvill. The vegetables are covered in dirt (as they should be), and the cheese, fish, and meat vendors will be able to tell you (with a smile) exactly where their produce came from. If you’re feeling peckish, the market also offers a small but pleasant selection of street foods: Indian restaurant Ostorozhno, Slon! (Careful, Elephant! ); and Vietnamese joint Lao Li are the pick of the bunch, which can be enjoyed with a coffee on the sixth floor with its stunning view over the entire market. This is a tourist experience, as well as a food run. When: Daily, 10 a.m. to 10 p.m. Originally set up in 1932 for collective farmers, this enormous trading spot serving Moscow’s southeast underwent a serious facelift in 2017, and has become a sight to behold, now housed in a well-lit, ritzy, wood-lined cabin. 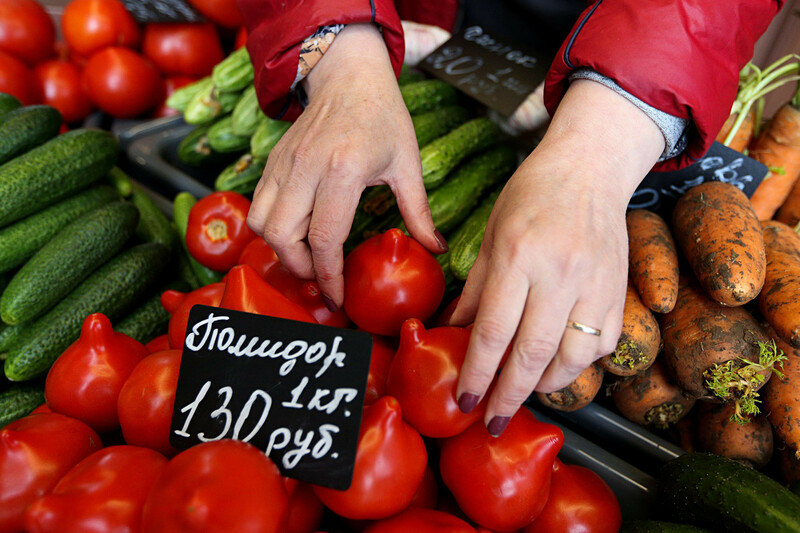 Specializing in local fruit, vegetables and fish, Velozavodskiy boasts fewer frills than some of its competitors. However, this means you can actually go there for your weekly shopping; after all, we can’t eat avocado and dragonfruit for every meal, can we? It also has some of the best Russian cheeses and dairy products, providing fine alternatives for foreigners who have trouble getting their hands on sanctioned goods. There’s also a small food court where you can grab a bite from the nearby cuisines of Uzbekistan, Georgia and Azerbaijan. When: Daily, 7 a.m. to 9 p.m. 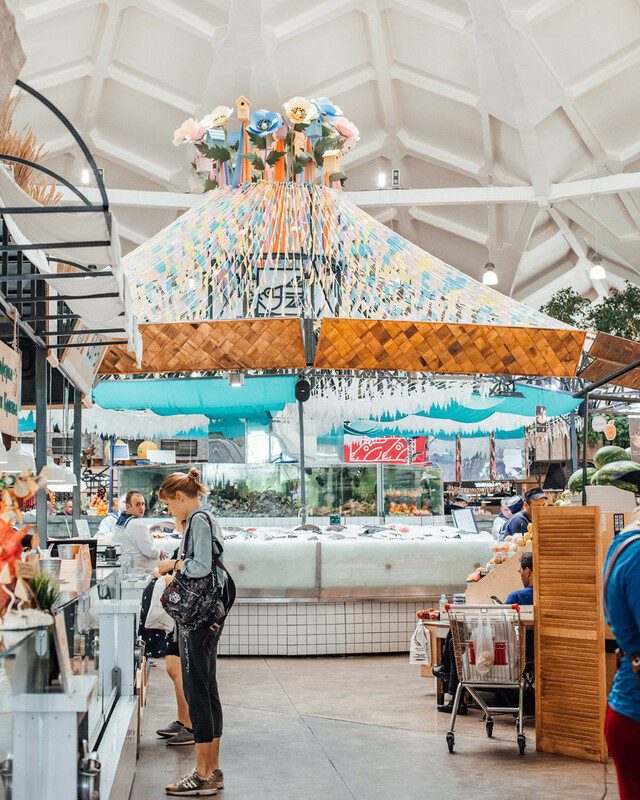 Somewhat resembling Danilovsky Market, this foodie’s bazaar has also undergone a recent upgrade that has changed the building beyond recognition. After turbulent times under mafia control in the 1990s, the market has been transformed with its stylish red brick and wooden exterior. Of all the fresh products, the gorgonzola, fresh salmon, and pork chops catch the eye most; and the selection of fruits is no less impressive. Among Usachevsky’s must-visit eateries are the Georgian joint Odzhakhuri (chicken satsivi is 250 rubles/$4); Pizza e Dintorni owned by Italian chef Vincenzo Delillo (one of Moscow’s best pepperoni pizzas for 440 rubles/$7.10); and the Armenian La Vash café, offering 7 dolmades for 300 rubles ($4.90). You’ll also have your pick of coffees, plovs and hummus. Well worth a visit. This neighborhood market is more than meets the eye. Located in the Taganka area, this cozy and unpretentious trading spot serves local residents with its large variety and low prices. Although Rogozhsky’s fruit and vegetables aren’t known for their value (blueberries can cost as much as 500 rubles, or $8), the market boasts one of Moscow’s best selections of sanctioned cheeses from France and Italy. And its bakeries - Karavai SV and Malenkaya Pekarnya Zhuralevikh - provide the district’s best fresh bread and coffee. 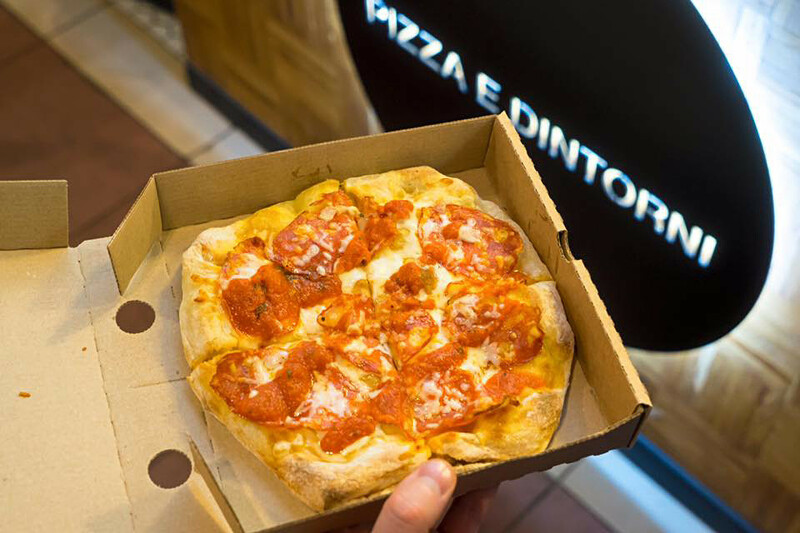 The main reason people come here is for the hidden gem that is Pizza Like Pie & Bike (PLPB), offering the capital’s most creative stone-baked pizzas; for example, their duck and onion chutney, or 4 cheese with mango pizzas that will set you back 450 rubles ($7.30). Vietnamese café Pho-Bo is also popular, while Krafter, a Belgian-style brewery and pub, serves delicious pints. But the best thing about Rogozhsky Market? You won’t have to stand in line. When: Daily, 9 a.m. to 9 p.m. This humble outdoor market is an authentic Russian experience, and also the best value for money for groceries in the capital. 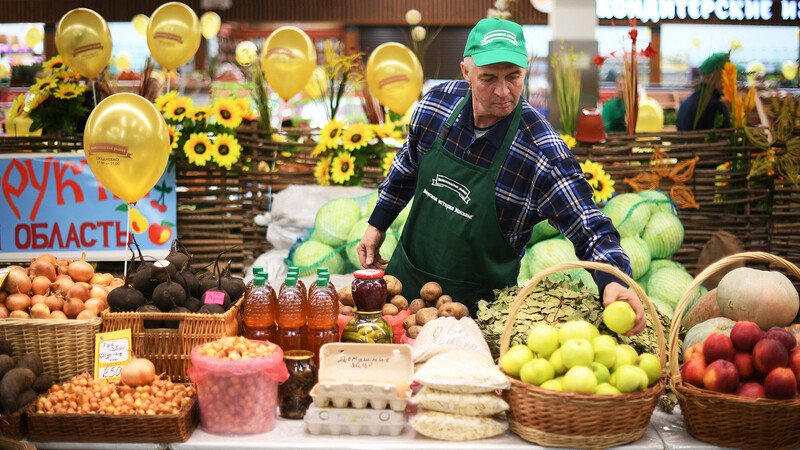 The fruit and vegetables are a highlight at Preobrazhensky Market, sold by local farmers with soil on their hands, bringing their produce to market in their cars. The prices reflect this, too: blackberries, raspberries, and blueberries sell for as cheap as 150 rubles ($2.43) per punnet – (they often go for three times that price in supermarkets). Avocados that usually cost around 100 rubles ($1.62) a piece in Moscow can be bought by the three for the same price. Perhaps best of all is the cheese selection, where contraband French and Swiss cheeses go for as low as 800 rubles ($13) a kilogram. Go on a sunny Saturday morning when it’s most vibrant – the perfect way to start a weekend. The most renowned farmer’s market in Moscow is a favorite among restaurateurs and foreigners alike. 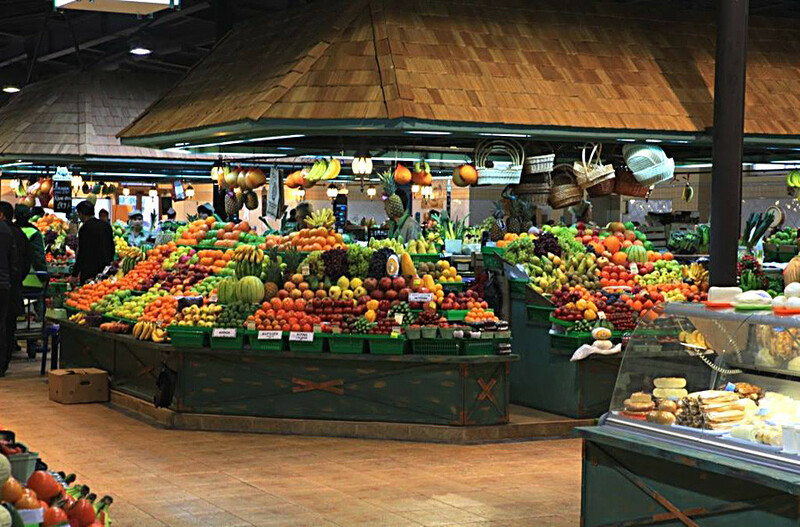 This is a true market experience – you’ll see fruits and spices from all over the world, as well as the country’s finest meat and poultry, sold by aggressive salesmen doing their best to convince you that theirs is the finest. While famously expensive, quality is assured. Be sure to check out the market’s assortment of Spanish cured meats, Black Sea fish, and Georgian products. Certainly chat to the vendors and haggle as if your life depended on it. When: Daily, 6 a.m. to 8 p.m.